Joseph, son of John and Mary Postle, of Ingham in the county of Norfolk, was subject to convulsive fits from his infancy, which were common and tolerable till he was about seven years of age. The cause of these fits is not clear: epilepsy is one of many possibilities. On occasion, these seizures had serious consequences. Sometimes he was thrown upon the ground; sometimes he was twirled round like a top by them; at others he would spring upwards to a considerable height, &c. and once he leaped over an iron bar, that was placed purposely before the fire to prevent his falling into it. He was much burned, but had been rendered so habitually stupid by his fits, that he never expressed the least sense of pain after this accident. The poor boy was so badly affected by his condition that he spent much of his time in an almost catatonic state. He did not acknowledge his father or mother by any expressions or signs; nor seemed to distinguish them from other people. If at any time he escaped out of the house without the observation of the family, he had not understanding to find and return to it but would pursue the direction or road he first took, and sometimes lose himself. On one occasion Joseph went missing for a whole night, and was found the next morning stuck in a fen, chest-deep in mud. He was very voracious, and would frequently call for something to eat; which was the only indication he gave of his knowing anything. No kind of filth or nastiness can be conceived, which he would not eat or drink without distinction. According to a neighbour, Joseph’s parents had to watch him closely to prevent him from eating his own excrement, so indiscriminate were his appetites. Despite this almost insatiable hunger, he lost huge amounts of weight. He was so much emaciated, that he seemed to have no flesh upon his bones; and his body so distorted, that he was rendered quite a cripple. His parents consulted eminent physicians in London and Norwich and eventually received a diagnosis: the doctors suggested that he had parasitic worms. But their medicines proved ineffective, and the parents began to believe that their child had fallen under ‘some evil influence’; their suspicion that his disorder had some supernatural cause was deepened when they noticed that it appeared to worsen during certain phases of the moon. In these miserable circumstances the boy continued to languish, till he was about eleven years of age (July 1757), when he accidentally found a mixture of white lead and oil, which had some time before been prepared for some purpose of painting, set by on a shelf, and placed, as it was thought, out of his reach. White lead (a form of lead carbonate) was the major constituent of lead paints, which are highly toxic – and therefore now rarely used. There was near half a pint of this mixture when he found it; and, as he did not leave much, it is thought he swallowed about a quarter of a pint of it. There was also some lamp-black in the composition; which was added to give it a proper colour for the particular use it was intended for in painting. It was, as I suppose it usually is, linseed oil, which had been mixed with the lead and lamp-black. Lamp black (soot) is essentially pure carbon, and although it is carcinogenic in high concentrations was unlikely to do much harm on this occasion. Linseed oil is edible and so posed no threat to Joseph’s health. A footnote suggests that the paint contained more whiting (chalk or calcium carbonate), than lead, since the former was often used as a cheap substitute. The fact that the boy survived does indeed suggest that he had ingested more chalk than lead. Whatever it contained, the paint mixture soon had a dramatic effect. This draught began to operate very soon, by vomiting and purging him for near 24 hours in the most violent manner. A large quantity of black inky matter was discharged; and an infinite number of worms, almost as small as threads, were voided. These operations were so intense, that his life was despaired of. But he not only survived them, but experienced a most wonderful change and improvement after them. A strange development followed: according to his parents, Joseph’s health began to improve dramatically. Instead of a skeleton, as he almost was before, he is become fat, and rather corpulent: and his appetite is no longer ravenous, but moderate and common. His body too is become straight and erect. He appeared, when I saw him, to have acquired nearly as much knowledge in four months, as children usually do in four years; and to reason pretty well on those things, which he knew. …which he discharges as carefully, and then returns as safely, as any person. It’s a strange tale, and one I’m struggling to explain. Worms do sometimes cause seizures, but they tend to do so when they have colonised the brain. 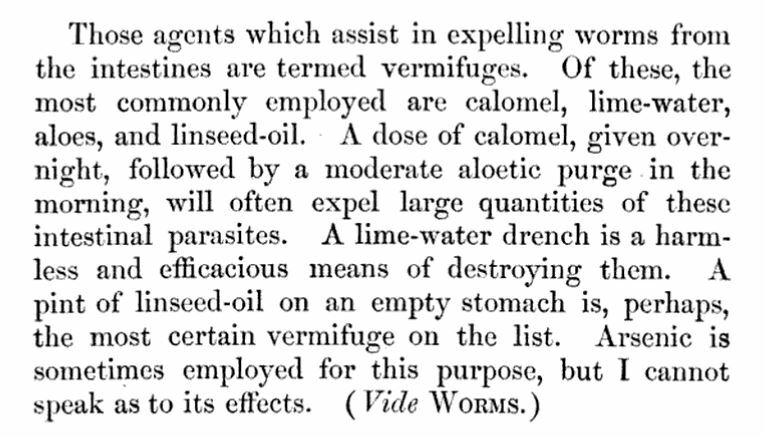 Could Joseph have ingested just enough white lead to kill off a substantial population of parasitic worms while still leaving his own health unimpaired? It seems most unlikely to me – but if you have more insight into this puzzling case please feel free to leave a comment. UPDATE: All is now explained, it seems. Many thanks to Dr Ramirez (in the comments below) and to Dr John Ross (via Twitter) who both got in touch to offer their expert analysis. Both agreed that the root cause of the boy’s illness was a serious infestation of parasitic worms. Several species of these worms (typically hookworm) cause such a degree of blood loss that the patient develops iron deficiency anemia. This can be particularly serious in children, causing delayed intellectual development and pica – a desire to eat inappropriate substances. A heavy load of parasitic organisms can also cause other types of electrolyte imbalance, and Dr Ramirez suggests that these caused the frequent seizures. So linseed oil would appear to be the magic ingredient. By drinking almost half a pint of the stuff, Joseph accidentally flushed out his intestinal worms – which in turn reversed his iron deficiency, banished the anemia and cured him of all the unpleasant symptoms that had blighted his life. By any standards, a genuinely remarkable recovery. Thanks for your comment. That certainly seems an intriguing possible explanation.